I didn't really get it at first. In fact, it took me a few hours before I really understood what was going on. Sort of like a first time at Mardi Gras — you know you're doing something fun, and everyone else is having fun, you're just not sure why you're there, or how this whole thing even got started in the first place. 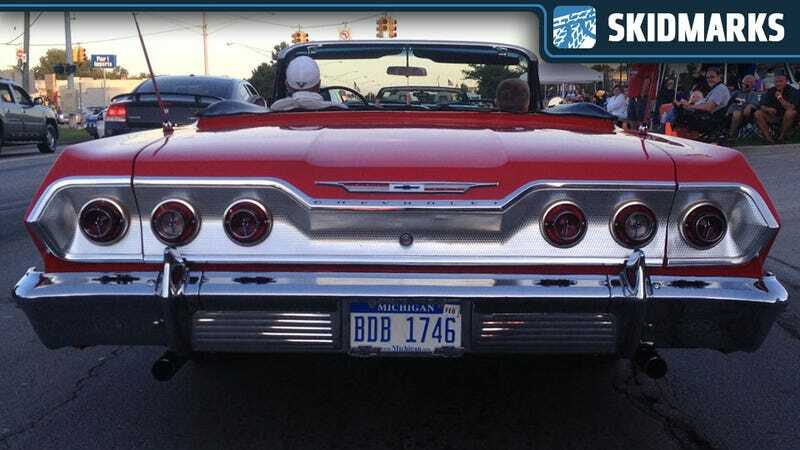 This is how I experienced my first Woodward Dream Cruise. I'm also not sure that I'm the right guy to explain this event to you. I've never owned an American car, let alone a muscle car. The whole thing is really a giant celebration of everything beautiful that's been designed and built by Detroit. While a lot of cars are simply parked, most of them cruise back and forth all day long in the right lane so the thousands of people lining the streets can soak it all in. I've never seen so many bias ply tires in my entire life! I hated the smell of lead fueled exhaust as a kid, but it smelled like roses on that Saturday. We arrived on the scene at Woodard and 13 Mile, one of the epicenters of the event, which stretches down Woodward Avenue from Ferndale in the south to Pontiac in the north. The road loops around the Silverdome where Ice Cube and Stone Temple Pilots were playing in the parking lot. At our intersection we had a giant Dodge factory display — this wasn't totally about the classic cars. The manufacturers play a huge role in this event and it seems like they delay the launch of cars until a month or two after Woodward so it can be a rare treat that Saturday when the new special edition cruises the strip. This isn't just about cars either. It's about your friends and cars. Everyone is here with his or her best car friend. You know, your friend whom as a kid, could tell you every car coming down the road by the headlights or exhaust note alone. I was there with Aaron Botsis, one of my oldest friends from race track days. Last time we hung out I raced some NASCAR mini-cups and then we drove thru the night to see motor GP at Indy. He heard I was going to Woodward and simply texted me "When do we leave?" Real car friends jump at the adventure of a road trip to a car event. It's almost the best kind. Remember the road trip in the Ford Focus ST when I "borrowed" the car from Ford for a trip to Monaco? I took Doug Guthrie of the Detroit News with me. Doug is a bit older then me but when we're in a car together we both feel like were 16 years old again. A few minutes later Doug pulls up in this new ZL1 Camaro convertible. I'm not totally sure what it is because people don't let me drive cars like that without supervision. But Doug is mature and GM handed him the keys to this unreleased car so he could cruise the strip. I jumped in with Aaron and one his car friends and we all rolled down Woodward in style. Every few seconds someone would ask "Is that the 13?" I almost answered "I think it's a ZL1 like it says on the hood" Doug quickly answered "Yes, it's the new model, a 2013, should be out in a month or so…"
The car was seriously cool. The coupe, as Matt Farah points out, is like driving a "hoodie" as you can't see anything. But man, that convertible was nice. I would change two things: get rid of the black suede seats. They might look cool in photos but suede doesn't breathe. At all. Trust me. Second, I would put the biggest damn air conditioning compressor known to man on the thing. It's a 6.2 liter. It makes 580 horsepower, I'm sure it can turn an industrial sized air conditioning set up. When I press "Max A/C" in a convertible I want my fingers to frost if you leave them in front of the vent too long. There should be danger warnings on the controls that read "WARNING: FROSTBITE DANGER!" But it did have this slick hood with carbon fiber inlays and vents that pull hot air from the radiator. Of course it had ZL1 badges placed in direct eyesight of any car that pulls up next to you at a light. They pretty much scream "you have already lost!" I like that. It was started in 1994, in Ferndale, by a man named Nelson House who wanted to build a soccer field for the kids in town. So they decided to have a car event to raise the cash — they were living in Detroit, after all. The following year they decided it was so much fun that they should do it again. Fast forward a few of years and you have one of the largest car events that I've ever been to without seeing a race. Doug told us about this Irish bar called Duggans that assumed the old drive-in menus as they started disappearing over the years. I was told to get the Big Chief Burger from The Totem Pole, which opened in 1954 and was the first drive-in restaurant to have a two-way radio to order food. In search of it we went. It was so ridiculously good. So were the ice cold beers -– even though we were in Detroit at a car event, we weren't driving. At this point I went out to meet my friend Matt Rogers and sat on the curb with some old-school drag racers while I waited. I was inches from the cars and so close I could feel the beautiful rumble of American iron in my chest. It was a special 15 minutes for me. I didn't need to be anywhere or get anything accomplished. I just sat there and watched the cars with some strangers. It turns out they weren't strangers at all, we had just never met. We were all car guys cut from the same mold. We were all sitting there together admiring the awesome machinery and laughing our heads off at some of the ridiculous contraptions that people spent money to build. Talking about how the real cars are even running period correct bias plys to cruise the strip. That's when it clicked: this was about cars and people who love cars. Nothing more, nothing less. Just cars. One of my favorite cars was the microchip car. I hope it has significance, like it's the first computer controlled engine, but I doubt it. The guy just slathered it in circuit boards. The detail was incredible. I love that he didn't ruin some sacred car but took this random piece of steel and made it art. I saw an old Batmobile, a dumptruck converted to an RV, awesome hotrods, and crazy Hemi Cuda's. There was Ferrari lying around too but no one seemed to care. Not even the kids — it just sat there like some nasty kit car from the future. This can only happen in Detroit. I doubt there are enough awesome old cars anywhere else in the world to fill anything even close to the Dream Cruise. Sure people drove and towed from all over to be a part of it but most of the cars had Michigan plates. And in case you couldn't tell, I had a ton of fun. Next year I'm bringing something to cruise in myself. Maybe I'll get lucky and talk a manufacturer into letting me "borrow" something special as well. You guys should come out and cruise around too. It's actually pretty fun.